What is everyone doing, hanging around? I'm glad someone snapped a photo of you like this! Ray: Many of them have travelled some way to bathe in the Sacred Ganges water, Elizabeth. I was pleased that Tim took this candid shot of me on the steps. Que de monde ! Jolies photos. So much to see, Ray. Good shot. 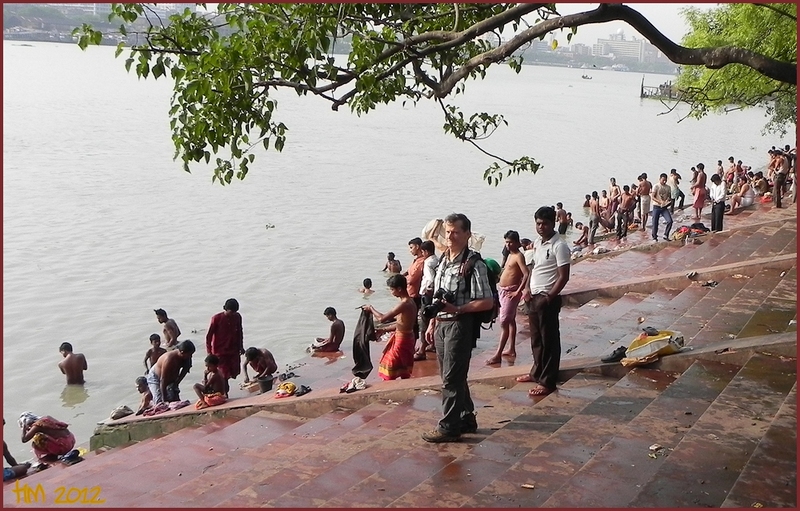 Ray: Since I was a young Lad, and read about the Indian tradition of bathing in the Ganges, I have wanted to visit and witness this activity...Tick! Ray: He is loitering with attitude, Chris...so is the bloke with the big camera in the bottom pic. I like the tree in the top picture and I note the explorer, centre stage, in the lower. Ray: I liked that tree too, Chad...it is the same one in the lower image. Crikey! It all looks like a seething mass of humanity. I think if you bathed in the gangs you may come out dirtier than you went in. In the UK we are making a big fuss about the amount of rubbish in the oceans with the Government talking about banning everything in case it ends up in the sea (I blame David Attenborough)'s programmes); I feel that we are not the main culprits here. Ray: Like most rivers in Asia, The Ganges is highly polluted for sure, Alan. That Attenborough bloke has a lot to answer for...including stealing many hours of my time when I was glued to the silly box watching his brilliant shows instead of riding my bike and useful stuff like that. Such a wonderful variety of colours in the clothing, Ray. Did you have the urge to dip your toes in the river yourself? Ray: I did not feel any need to get wet at this pace Beverly. Not a river I'd care to bathe in! Ray: I felt no urge to be wet, Tom. Ray: That camera dude is clearly an important bloke, Peter! I have seen movies here or somewhere like it. Now, you're the star. Ray: I understand this is a popular place for bathing, Mary, so it is likely to have featured in movies. There always seems to be lots of people about everywhere. Ray: There are not many quiet places in India, Brian. You're really taking us on this journey!! National Geographic!! all are good but the top shot has some excellent aspects going for it, Ray (in my opinion)!